We’ve said goodbye to 2014, and we’ve sipped from our first glass of 2015 champagne. In that time, we’ve had chance to think about what’s going to emerge in the next 12 months for the world of Dynamics. Here are some of our 2015 Dynamics predictions. If you ask Partners, they’ll tell you there’s always a drought of Dynamics ERP and CRM-qualified professionals. On 5th-9th January, Microsoft’s taking strides to correct this with Career Connect Bootcamp, which will be a US-focused programme aimed at training up recent graduates for work in the Dynamics arena. If the programme’s successful, it might make an appearance in other talent-starved areas, too, like the UK. 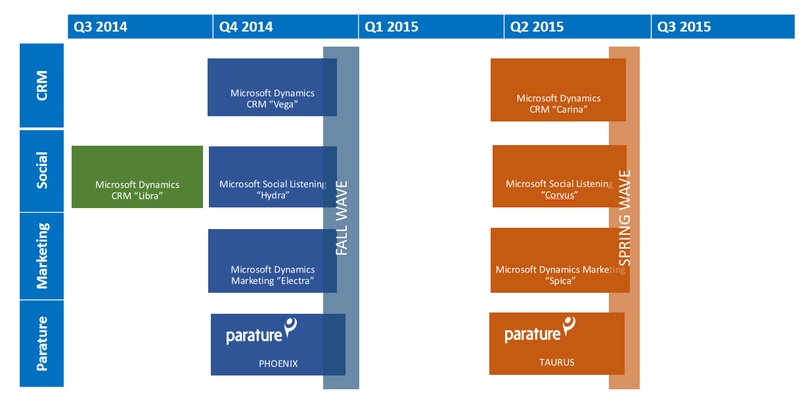 The end of 2014 saw the launch of Microsoft Dynamics CRM 2015 and Dynamics Marketing 2015. Now, we’re looking forward to seeing what Microsoft has in store for Parature. Set to appear early in 2015, Parature has a number of exciting new features, including: knowledgebase management and reporting improvements, comprehensive service desk configurations, new social channel monitoring, and real-time chat translation. Last summer, Satya Nadella told Microsoft employees that Microsoft is a “productivity and platforms provider”. The product that probably demonstrates this the most is Office 365. Now viewed as the company’s “most strategic developer surface”, Office 365 is now considered the priority profit maker for Microsoft. Last year, the company launched office Graph, and promised a set of brand new APIs and SDKs for Office 365 devs, which it delivered in October at its TechEd Europe conference in Barcelona. Bringing together office Graph with SharePoint, Exchange, Office and Dynamics, Microsoft is expecting office 365 to do well in 2015. Each year, the Dynamics-focused Convergence conference introduces the Microsoft Dynamics community to new products, and helps connects people to their global peers and other experts in the field. This year is set to be no different. With Microsoft CEO Satya Nadella and VP of Microsoft Business Solutions Group Kirill Tatarinov both set to provide keynotes, this year’s Convergence conference in Atlanta, GA, on March 16-19th, is set to be unmissable. Register today. At his first UK-based public talk since taking on the CEO role, Nadella stressed the importance of Microsoft’s ‘mobile-first, cloud-first’ ambitions. This will be especially vital going forward into 2015 and beyond, as the “richness of th[e] compute fabric” increases. With more devices and sensors pointing at us than ever before, it’s more essential that our devices and services are accessible wherever we are. Azure and the cloud facilitates this. For our thoughts on these events, products and services as they happen throughout the year, join us on Facebook, Twitter and LinkedIn.